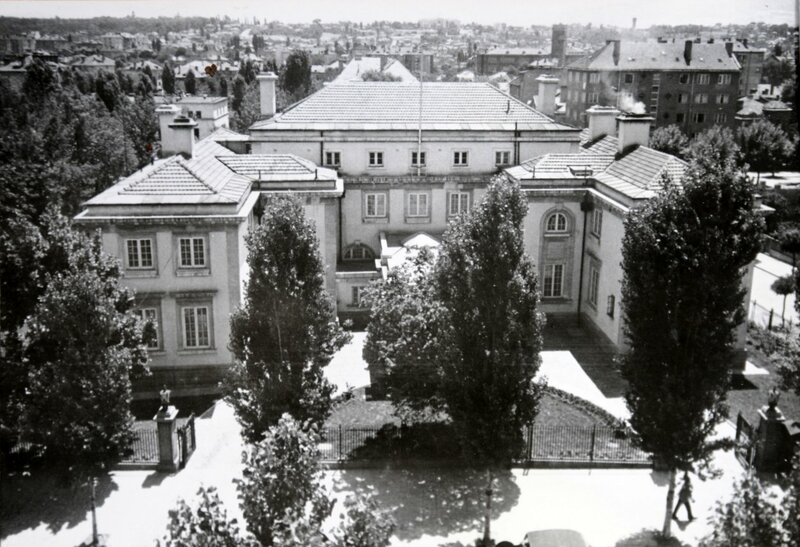 When Herbert Willis, the Office of Works architect based at Constantinople, was visiting Sofia in 1906 to look for alternative premises for the agency, he learned that some years previously the Bulgarian government, nominally then still under Turkish suzerainty, had presented the British government with a site on which it could build. No use had been made of the site and the offer was, in effect, withdrawn. Willis therefore called on several Bulgarian ministers and they agreed to consider whether to renew the offer. The Foreign Office followed this up and the Office of Works asked the Treasury whether, if a new site was offered, it would support building a new house on it for the agent and consul-general. The Treasury agreed in principle. A year later the Bulgarians did offer another site, on the same main road and within 300 metres of the then leased agency house. Willis inspected this new site on Christmas day 1907 and found it satisfactory in all respects, especially because that area was becoming Sofia’s best residential quarter it and the government was striving to rival Bucharest for the title of ‘Paris of the Balkans’. The Bulgarians proposed that the site, at 67 Boulevard Tolbukhin (later Boulevard Ferdinand, now 36 Boulevard Vasil Levski), should be equally divided between the British and German governments: unless lots were to be drawn, Willis chose the eastern half and that was subsequently accepted. Bulgaria formally declared its independence in 1908 and the status of the Post accordingly changed from agency to legation. But it was not until March 1910 that the Municipal Council of Sofia finally signed the Act of Possession that transferred the new 3,150 square metre site at nil cost. 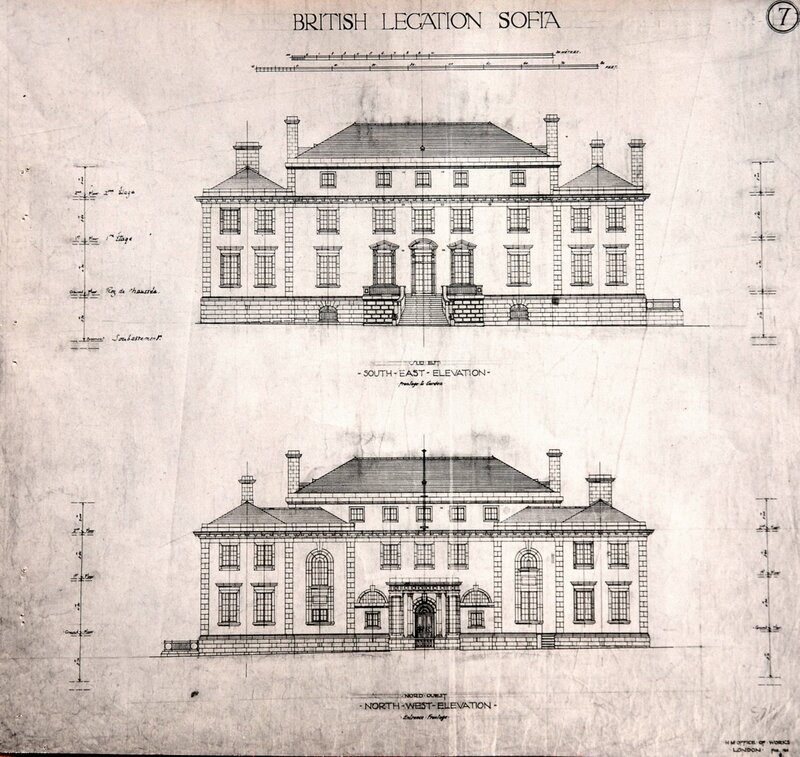 Meanwhile, Thrift Reavell, an experienced architect in the Office of Works in London, had visited Sofia twice and produced a design for a legation house which met with the approval of the minister. After some disagreement with the Treasury about the estimate of £22,500, construction work started on site in 1911. Construction work on the house was suspended in autumn 1912 because of a labour shortage caused by the First Balkan War, and resumed spasmodically in 1913. The house was eventually finished in 1914 at a total cost of £26,500 but hardly occupied before the staff were withdrawn when Bulgaria entered the First World War on the German side in October 1915. 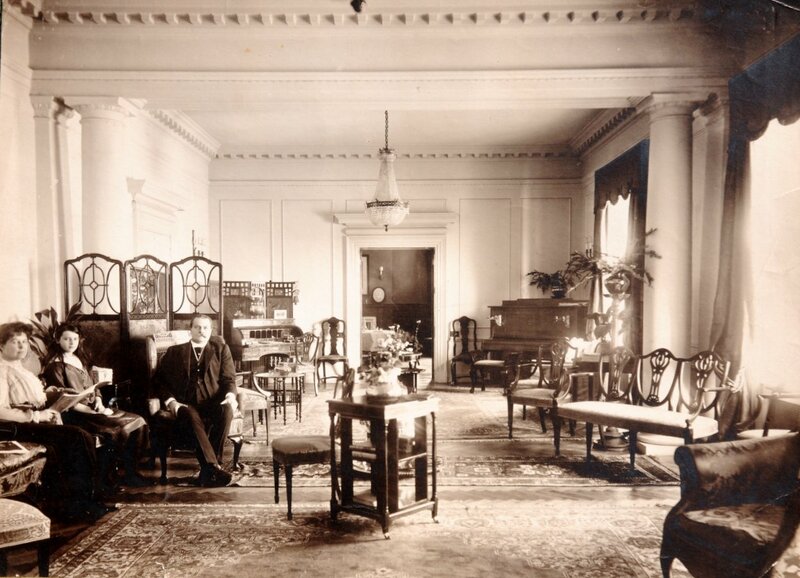 When Willis visited in July 1919 he found the house in reasonable order, and occupied by the head of the military mission, five of his staff, six orderlies, the chief servant, the Office of Works caretaker with his family, and two women servants. The next occupant, the high commissioner, Herbert Dering, strongly maintained that the garden was too small. 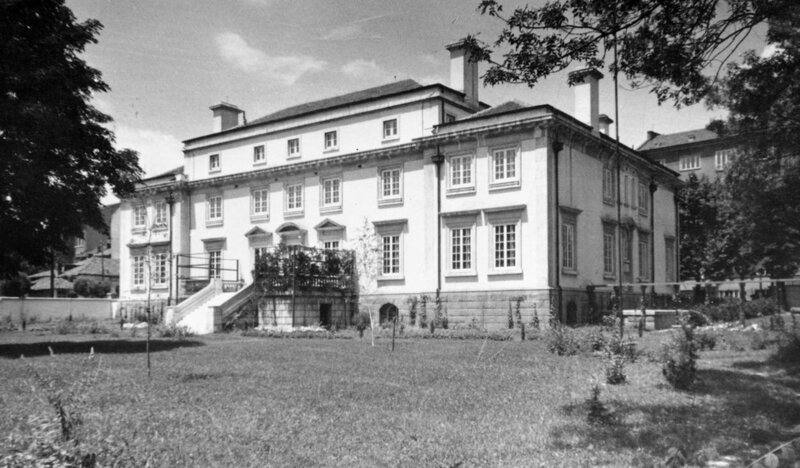 The Secretary of the Office of Works, Lionel Earle, who had visted Sofia in 1914, agreed with him: ‘The garden, about ¾ of an acre is in my opinion too small in conjunction with so good a residence; there is no room even for a full-sized tennis court.’ Fortunately, there was an available solution. The German site next door still lay vacant and, if the Treasury would agree to spending £900 or so, a strip about 12 metres wide and the full length of the site could be acquired. The Treasury did agree, and a notarial Act of 15 March 1922 added an 861 square metre strip to the eastern side of the British site for the sum of £898. A garage for the minister’s car was built soon afterwards at the south end of this strip, next to the house. The remainder of the former German site was disposed of piece-meal. The Office of Works sought to buy the corner of it that was closest to the new garage so as to build some offices to relieve over-crowding in the legation house. That attempt failed, and a five-storey block of flats of dubious quality was built instead by others on this corner in the mid-1930s. When all the offices moved into this adjacent block after the Second World War, their vacated space in the legation house, mainly in the basement, was available for various social facilities like club, cinema, library and commissariat that became essential for the welfare of UK-based staff during the grim years of the Cold War. 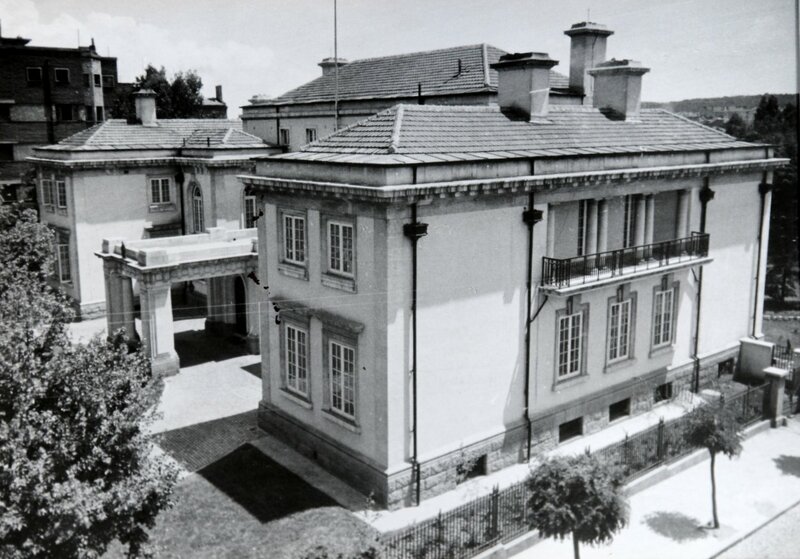 The status of the mission was raised to embassy in 1964, in which year the swimming pool was also built in the garden. The garages on the former stable site on rue de 6 Septembre were rebuilt in 1976, including workshops. 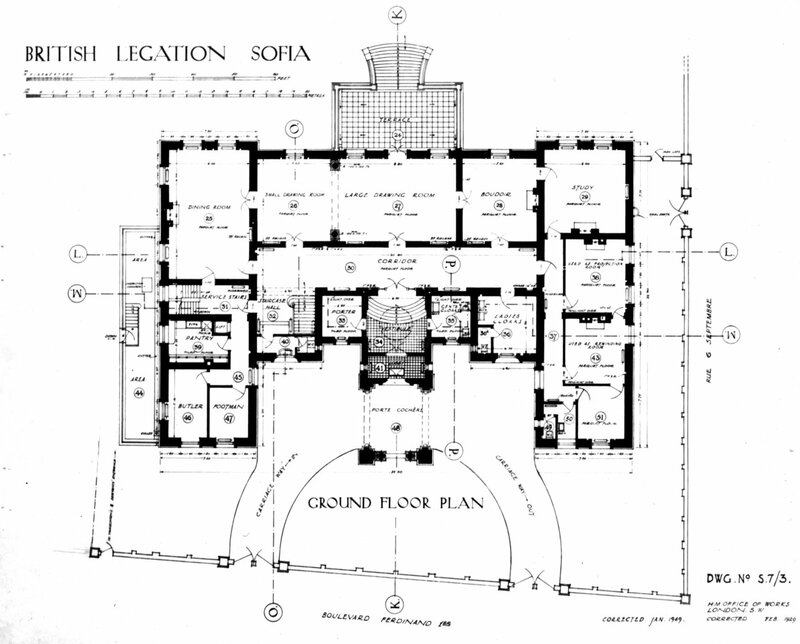 In Thrift’s original design, the offices were on the ground floor of the west wing, connecting to the main corridor and the study. They gradually expanded and took over other rooms, including in the basement. By 1938, the pressure they created on the residence caused one section of the offices to move into a flat in the block recently built next door. 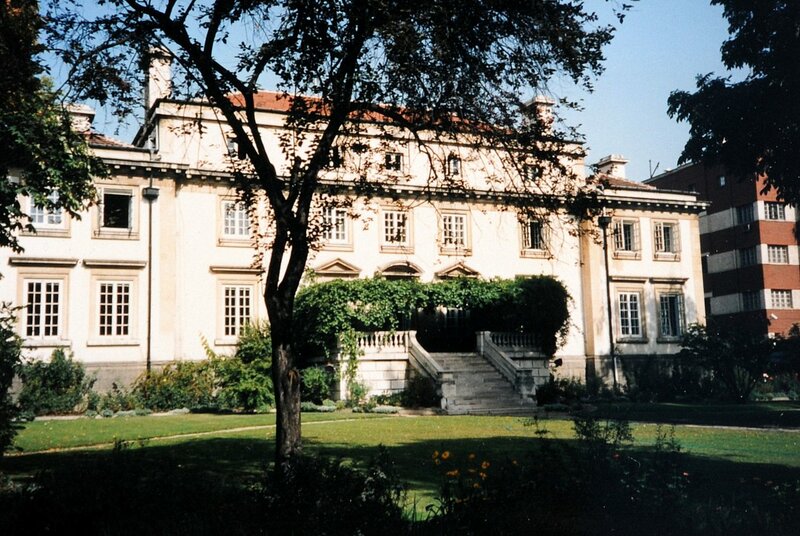 After the Second World War, in 1947, the whole of that adjacent block was leased as offices from the Bureau for Servicing the Diplomatic Corps (BODK – modelled on the Soviet UPDK) and they all moved out of the legation house. This block was never satisfactory, and by 1990 was severely substandard, even in structural terms, but security worries rendered it impossible to deal with basic maintenance problems in offices during the Cold War. 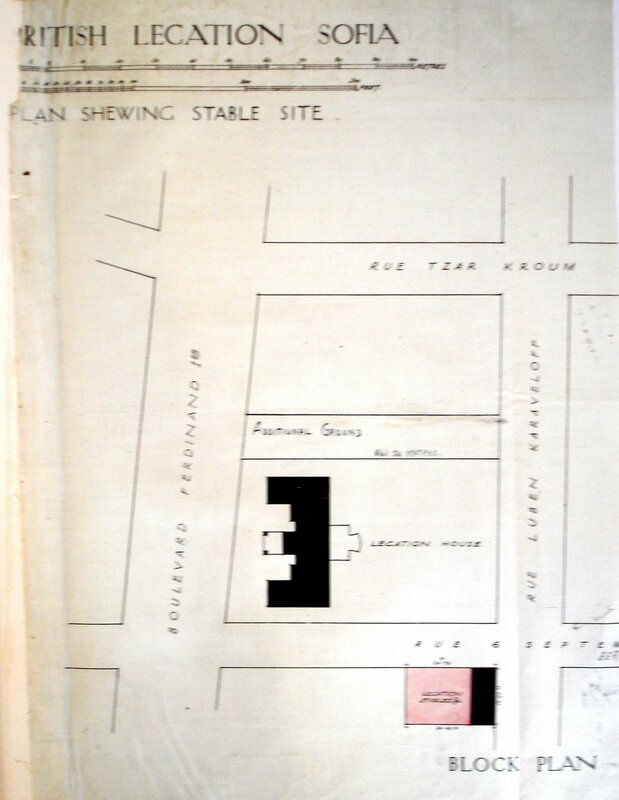 Location plan, with stables site and additional garden strip, c1925. Garden (south) elevation above, and entrance (north) elevation below, 1911. North west corner and west wing, 1920s.